Philips Advance Mark 10 Powerline High frequency electronic dimmable fluorescent ballast has durable metal SC construction and programmed start type. It is voltage rated at 120-Volts AC, power rated at 10 to 41-Watts, current rated at 0.32-Amp, temperature rated at 70 deg C and frequency rated at 60-Hz. It features series lamp connection circuitry and an automatic restart. 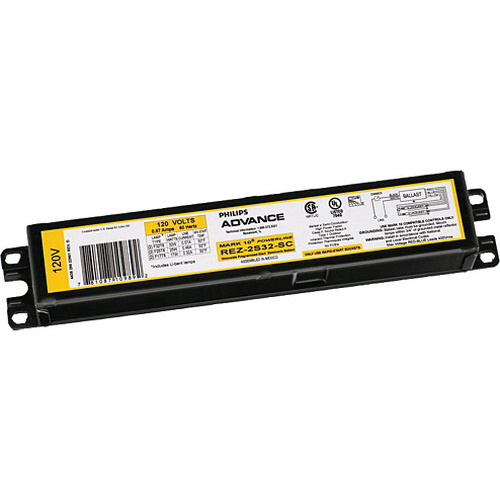 This ballast supports 40-Watt FT40W/2G11/RS, PL-L40W, F40BX and FT40DL/RS fluorescent lamps that provide wide range of lumen output. It has 1.7 crest factor and 0.5 mm/0.375 mm of wire strip. It is suitable for conference rooms, private offices, auditoriums and architectural cove lighting. The electronic dimmable fluorescent ballast meets UL, CSA, CEC, RoHS, FCC Consumer and ANSI C62.41/C82.11 standards.